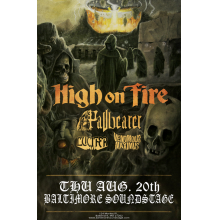 High on Fire has been a regular part of the touring circuit for quite some time now, often heading around North America with each album release. The last time I saw them was a co-headlining show with Eyehategod last year, and that performance had a ton of energy and the extremely heavy sludge meets thrash sound that the band has maintained for their entire career translated over perfectly live. With a new album (Luminiferous) out this year it was time for another headlining run from Matt Pike and company, and they brought along Pallbearer, Lucifer, and Venomous Maximus along. The stop at Baltimore Soundstage was one of the last dates on the tour, but you wouldn’t have guessed it from the on-stage energy from every band that night. Houston doom/heavy metal group Venomous Maximus started things off, and they were another act whose name I had come across before but hadn’t spent a whole lot of time with. What I was met with as they took the stage was a healthy dose of riffs that sounded like they were influenced by late 70s hard rock/proto metal bands that would go on to shape the traditional heavy metal sound along with a healthy dose of doom. But this doesn’t mean that they’re merely going for that full on retro sound, as the way that the instrumentals all merge together felt fresh and not just a rehash of one particular band. It was a nice way to kick off the night, as the catchy guitar leads and rock/heavy metal crossover had the crowd moving even this early on. However, while the instrumental work grabbed my attention right from the start there was something about Gregg Higgins vocal delivery that wasn’t quite clicking. His voice is slightly higher pitched and falls somewhere between old-school biker rock and heavy metal, but something about it just seemed slightly off. Considering just how energetic and over the top the dual guitar work is, Higgins seems far too subdued to the point that the vocals are just kind of there in the background instead of adding that extra oomph to the songs. It wasn’t bad by any means and there seemed to be plenty of people in the audience that dug the set so maybe it’s my personal taste, but Venomous Maximus didn’t click with me as well as I had hoped. I was surprised and excited to see that Lucifer was able to make it over to North America so shortly after their formation, as they have only been in existence for about a year. For those that haven’t come across the doom band, they were formed shortly after The Oath’s sudden dissolution. Singer Johanna Sadonis joined forced with Angel Witch drummer Andrew Prestridge and former Cathedral guitarist Gaz Jennings and they released their debut earlier this year via Rise Above Records. Sadonis’ haunting vocal delivery had drawn me to The Oath and I was excited to see what Lucifer had to offer, and while debut single “Anubis” seemed like it was playing it safe the Lucifer I album revealed the group’s full potential. Lucifer’s overall sound pulls a significant amount of influence from the earlier heavy rock and doom bands, as opposed to the distinctive NWOBHM flair that was present in The Oath. It translates over perfectly live, as the slow grooves and haunting guitar leads filled the air completely captivated the audience. Sadonis also brought a significant amount of presence to the stage, wearing a robe with an eye on the back and letting her voice absolutely soar throughout the room. The way that she’s able to let each word hover and expand outward fits the doom aesthetic that Lucifer is going for perfectly, and there were definitely some moments where she seemed to be channeling Jinx Dawson from Coven. It was a great performance that left me wanting more, and hopefully this group sticks around for longer than The Oath as not only would I love to see them on-stage again but it will be interesting to see where they progress to musically as the years go by. Pallbearer was up next, and though I’ve seen the sheer amount of hype for both of their albums I hadn’t had the chance to really absorb the doom band’s material in depth. This isn’t necessarily for lack of interest, but simply because it’s hard to keep track of all the fantastic metal groups out there with how much volume comes my way as a reviewer. Seeing them live seemed like the perfect way to rectify that, and I went in with quite a bit of expectations. I had been told that Pallbearer plays extremely loud and heavy, and while it wasn’t quite as loud volume wise as I expected (perhaps due to the venue’s PA) the tonality was still extremely heavy that every note hit you right in the gut with a significant amount of weight. And man, upon hearing the type of sprawling instrumentation that had equal amounts of somber melody and crushing heaviness I realized that I really should have paid more attention to these guys a lot earlier. The instrumentals sounded fantastic, and even though just about every song they played during this set was ten minutes or longer there was so much to take in that it never seemed to become tiring or repetitive. Brett Campbell’s vocal style is also a refreshing change from the typical gruff scream/growl that’s so typical for doom these days, as his higher pitched clean singing melds perfectly with the leads to create this melancholic yet intoxicating atmosphere. Pallbearer did seem to have a bit of issues with the sound on-stage, as they had some feedback completely drown out the backing vocals during some key moments. But despite some visible frustration they didn’t let them shake them and still delivered an engaging set that everyone in the crowd was absolutely eating up. Now if you’ll excuse me, I have two full lengths worth of doom to completely lose myself in as I make up for lost time. Each of High on Fire’s full lengths have seemed to make subtle changes to their combination of heavy hitting sludge and faster thrash sections, but they nailed this particular sound so early on that it has never been that big of an issue. That’s not to say that they’ve merely been repeating their ideas from one album to the next, but rather that it’s possible at this point to go into a High on Fire record with a pretty good idea of what to expect. The same is true of their live performance, as you know that every time Matt Pike is going to come out onstage shirtless and then the group is going to launch into a set that’s heavy from beginning to end. Since this tour was in support of their new release Luminiferous a decent amount of the material was pulled directly from that record, and these new songs translate over just as well as anything else in High on Fire’s discography. Aside from the new songs the lengthy set included a little bit from almost every other album, even heading all the way back to The Art of Self Defense with “10,000 Years”. What I like the most about seeing a set from these guys is how the intensity never dips, no matter what speed they’re going on. Though the crowd always seems to get amped up and mosh like crazy during the faster thrash moments, there’s so much weight to the instrumentals during the slower sections that it still makes one hell of an impression. Pike’s gritty vocals that never dip out of that extremely low and scratchy spectrum are always enjoyable too, and he’s great at getting the audience riled up even more than they already are. When I saw them at Ottobar last year his singing sometimes seemed like it was getting drowned out, but this time around the mix was a bit better and Pike seemed to be towering over everything else for the majority of the set. High on Fire’s always able to deliver what the fans want live and this most recent Baltimore performance was no exception.